Phyllo wrapped asparagus recipe with a lemon garlic aioli dipping sauce. Follow a step-by-step tutorial to make the perfect appetizer for your next party. Here’s a lesson I learned making asparagus phyllo wraps: Even someone who avoids vegetables will like asparagus if wrapped in phyllo pastry dough and dipped in lemon garlic aioli. Everyone else will love it! 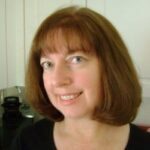 It’s the same phenomenon that occurs when I pair Carrot Fries with Yogurt Dill Dipping Sauce and Baked Green Bean Fries with Balsamic Yogurt Dip. I’ve always said that vegetables just need better PR. The presentation and dipping sauce make all the difference. The pastry covering used in this recipe makes the asparagus stalks easy to pick up and eat with your fingers. It’s an excellent party appetizer! 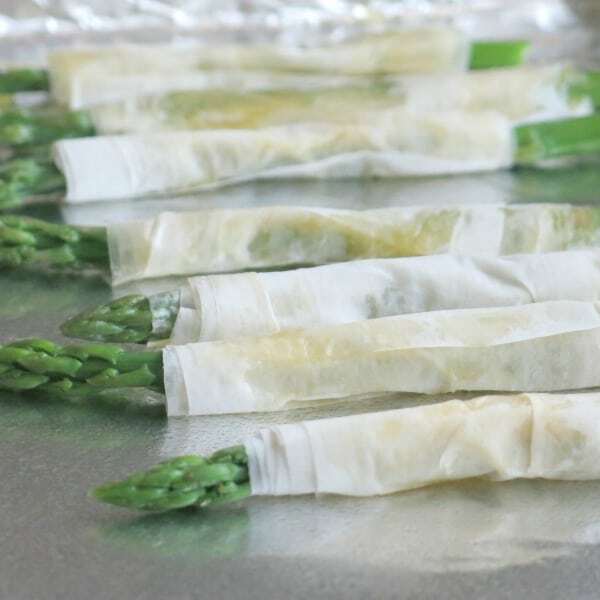 We’ve detailed each step in the process to make asparagus phyllo wraps below and answered questions that frequently come up. Or, hop down for a quick video just before the recipe instructions. Do you need to cook the asparagus first? To blanch or not to blanch. That is the question. It can be made both ways. Blanching is definitely recommended for thicker stalks so the final phyllo wrapped asparagus spears won’t be crunchy. After breaking off the tough ends of the asparagus, bring a pot of water to a rolling boil, submerge the asparagus for 2-3 minutes, depending upon the size of the stalks. When removed from the water, the stalks should be firm. Transfer them from the boiling water with tongs and immediately submerge them in a bowl with ice water for about a minute. Finally, remove the stalks to a paper towel and pat dry before proceeding to the next step. How much dough will you need? It depends upon how many asparagus spears you have. A 1 pound box of Athens fillo dough contains forty 9 x 14 sheets. There are two packets in a box and each packet contains 20 sheets. Once defrosted, roll out the dough from one packet, keeping it stacked. 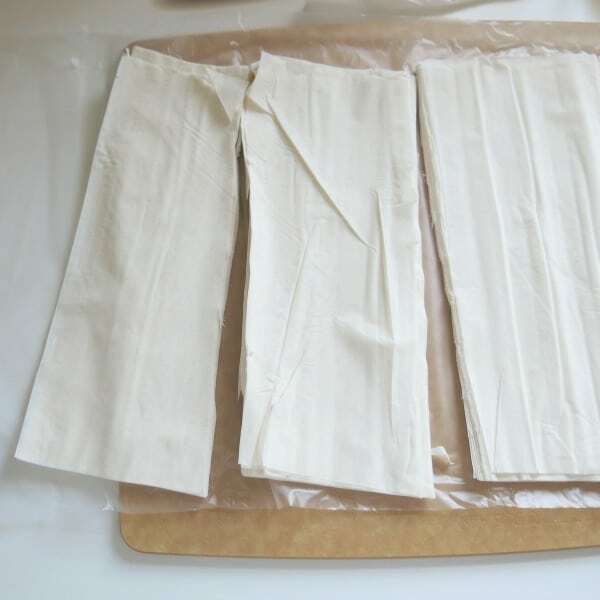 Using scissors, cut the stack in up to 4 strips that are about 3 1/2 x 9 inches. 4 sets of strips will wrap 80 asparagus stalks. If you are not going to wrap that many, adjust accordingly! Keep the rest of the dough for another use, like making Phyllo Wrapped Salmon. Keep the phyllo dough moist by placing a lightly damp cloth or paper towel over it. Keep dough in the refrigerator when you are not using it. Don’t worry about rips and tears…it will taste great! I promise! Make ahead tip: You can’t rush the defrosting process for phyllo dough. Lift it out of the freezer the night before you want to make this recipe! Next, melt butter and gently brush it over a strip. Brush one or two at a time because a little too much butter quickly makes the dough too soft to work with. Use a non-dairy alternative or olive oil to make this recipe vegan. Roll each asparagus in phyllo dough, jelly roll style. Place a stalk of asparagus near the end of the phyllo dough strip and then use fingers to roll it up. Tip: many hands make this job much faster…and fun! Immediately place the asparagus phyllo wraps on a baking sheet sprayed to prevent sticking. Brush a little more butter over the top. Bake in a 375 degree oven for about 15 minutes or until the pastry is lightly browned. While the asparagus are in the oven, make lemon garlic aioli by mixing together mayonnaise, lemon, garlic and paprika. 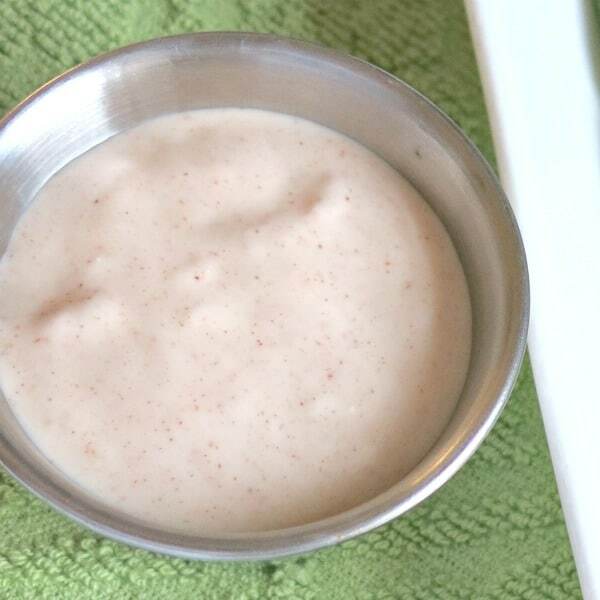 This easy dipping sauce is delicious drizzled over fish, chicken and just about any vegetable! Make it vegan – Use vegan mayonnaise or olive oil. Add Parmesan cheese – Sprinkle Parmesan cheese over a phyllo dough strip and then top that layer with another strip of phyllo dough and then roll the asparagus in the double-layered dough strip. Note that you may end up using more dough for each bundle. Double it up – You can put 2-3 asparagus in a strip of dough. This works well when it will be served as a side dish that will be eaten with a fork. 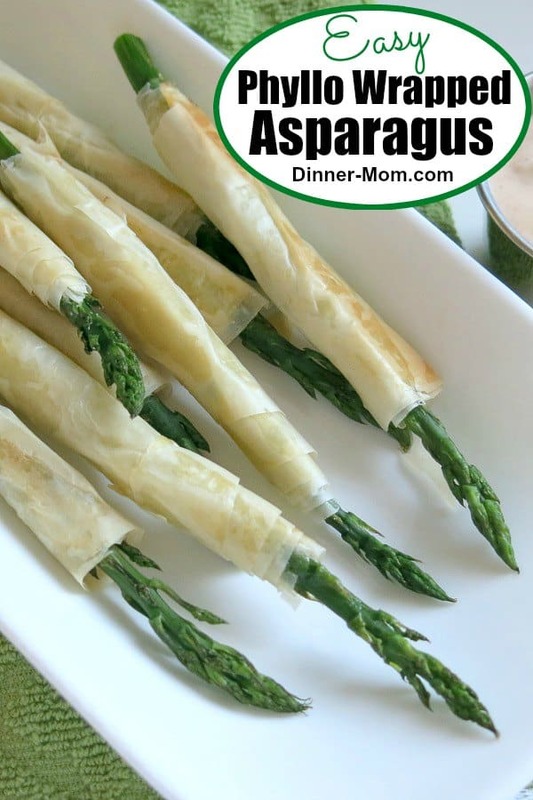 Please rate these asparagus phyllo wraps if you make them and date @DinnerMom or #DinnerMom on social media. We love to see what you are cooking up! 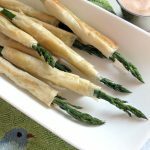 Asparagus wrapped in phyllo pastry dough with a lemon garlic aioli dipping sauce will wow a crowd. Detailed tutorial and lots of tips to adjust the serving size and customize for vegan or low-fat versions. 4 ounces Phyllo pastry dough, defrosted 1/4 of a 1 pound box. Reserve the remaining dough for another use. Wash asparagus and break off tough ends. Bring another pot of water to a rolling boil. 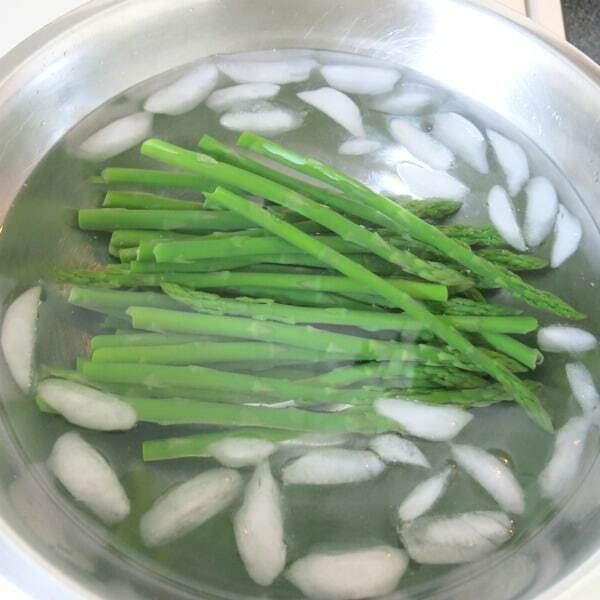 Remove asparagus and submerge in ice water for about 1-2 minutes. Cut phyllo pastry dough into strips. Unroll 1 packet of dough and cut the dough in half. Then, cut each half down the middle. Reserve remaining dough for another use. 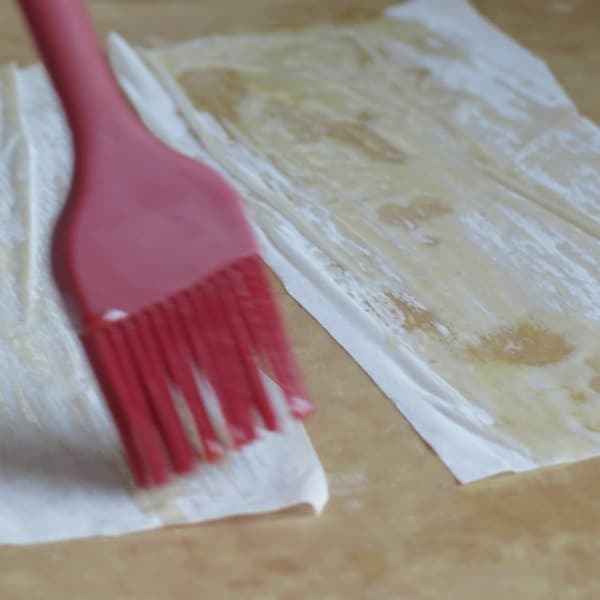 Keep unused dough strips covered with plastic wrap and a damp towel. If not using phyllo dough for an extended period of, keep it in the refrigerator. Using a pastry brush, spread melted butter over a phyllo dough strip. 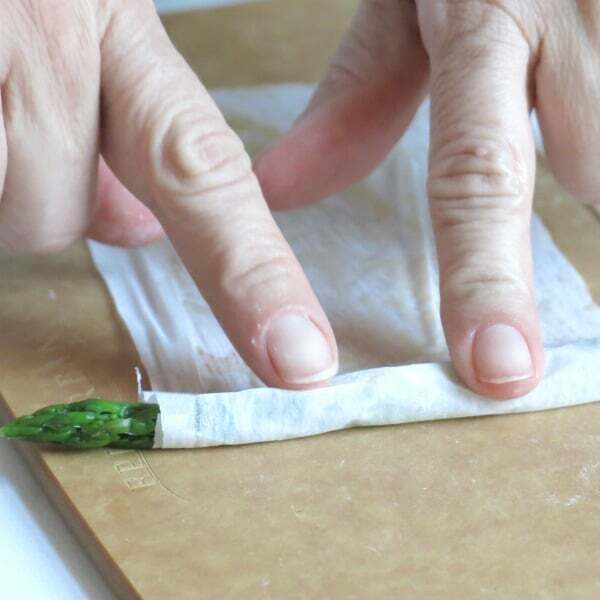 Place asparagus at one end and roll up jelly style. Place asparagus on a cooking sheet coated with cooking spray. Repeat for each asparagus stalk. Lightly brush butter over the rolled asparagus stalks on the cooking sheet. Bake for about 15 minutes or until pastry dough is lightly browned. Adjust the servicing size using this information: A one pound box of Athens fillo dough contains 40 sheets in two packets. One 20 sheet packet will cover 80 asparagus stalks, because the stack is cut into 4 sets of strips that are about 3 1/2 x 9 inches. To make it vegan or low-fat by selecting the appropriate butter substitute or mayonnaise. This looks like the ticket for recalcitrant asparagus eaters! I love eating anything with my hands, so the idea of being encouraged to pick up the stalks (as opposed to just picking them off the baking sheet after roasting because I can’t stop myself and wait until serving) has great appeal. Thanks Tammmy! I love asparagus too! Such a great idea. I bet the crunch w/ the asparagus is great. What a fantastic idea – I’m definitely making this. It’s a perfect appetizer for a spring party! Did a practice run of these for a brunch that I’m having and they were delicious! A little effort but definitely worth it. I’m going to have the kids help roll next time. Thanks for the recipe!